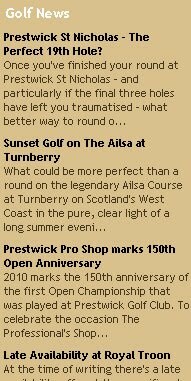 We've been working this week on updating the website and blog for Scotland's West Coast Golf Links - a collection of ten of Scotland's finest links golf courses. We've done some updating of the group's homepage the most visible being the insertion of the news items directly from the blog to give the page more immediate interest to the visitor. We've also inserted the Facebook Connect button which should be interesting to monitor as it allows Facebook users to click Like directly from the page and post a comment without even leaving the site. Really cool little function that you should consider for your own website. 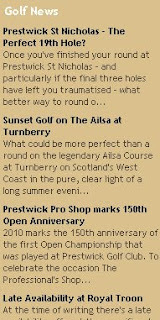 The blogs get indexed very quickly indeed and should be seen as a positive distribution channel – for example open Google and search for “sunset golf Ayrshire” – it was only published at 12.15pm yet it’s indexed first and second on Google already and ahead of the Turnberry listing itself – this isn’t an issue as it has a direct link back to the website.